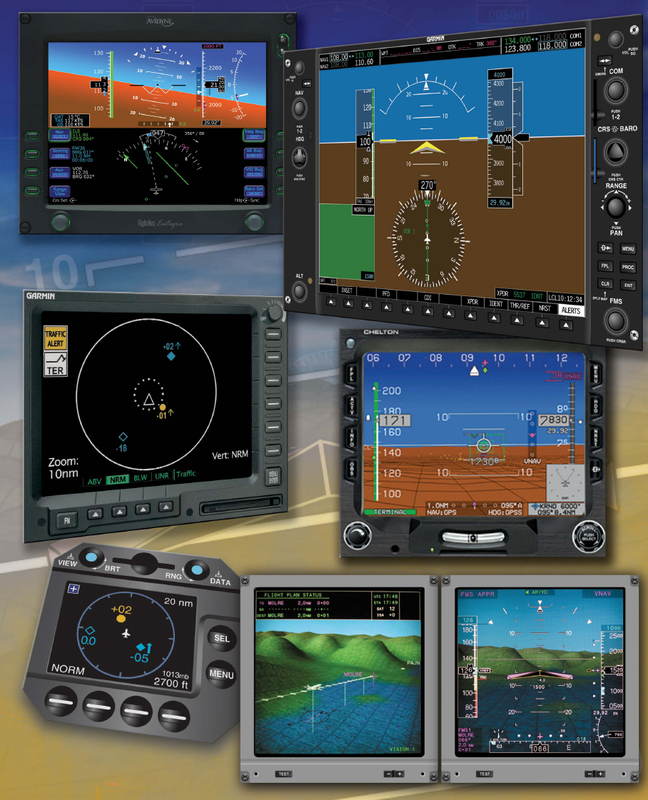 In the general aviation (GA) community, an automated aircraft is generally comprised of an integrated advanced avionics system consisting of a primary flight display (PFD), a multifunction display (MFD) including an instrumentcertified global positioning system (GPS) with traffic and terrain graphics, and a fully integrated autopilot. This type of aircraft is commonly known as an advanced avionics aircraft. 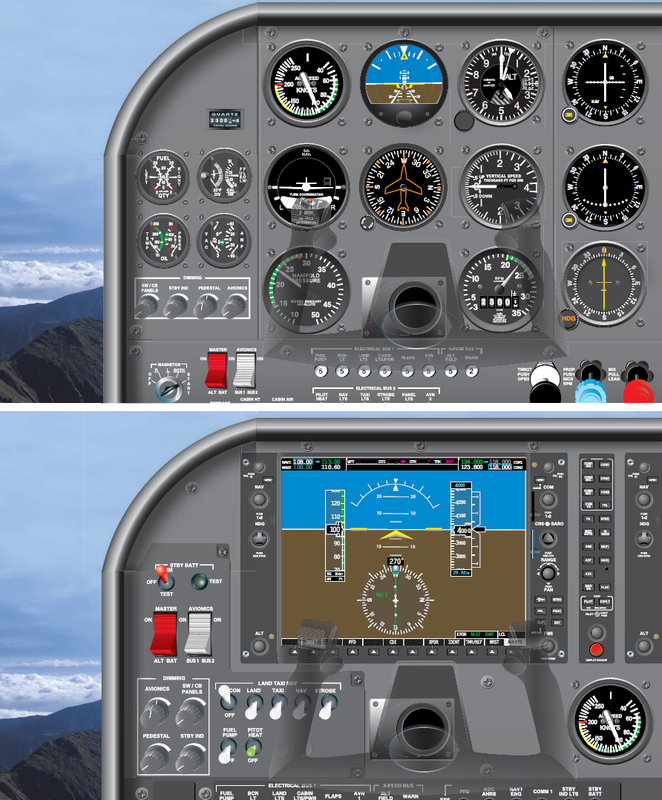 In an advanced avionics aircraft, the PFD is displayed on the left computer screen and the MFD is on the right screen. Figure 7-1. Electronic flight instrumentation comes in many systems and provides a myriad of information to the pilot. More pilots now rely on automated flight planning tools and electronic databases for flight planning rather than planning the flight by the traditional methods of laying out charts, drawing the course, identifying navigation points (assuming a visual flight rules (VFR) flight), and using the pilot’s operating handbook (POH) to figure out the weight and balance and performance charts. Whichever method a pilot chooses to plan a flight, it is important to remember to check and confirm calculations. Most of the aviation community believes automation has made flying safer, but there is a fear that pilots fail to see that automation is a double-edged sword. Pilots need to understand the advantages of automation while being aware of its limitations. Experience has shown that automated systems can make some errors more evident while sometimes hiding other errors or making them less obvious. In 2005, the British Airline Pilots Association (BALPA) raised concerns about the way airline pilots are trained to depend upon automation. BALPA felt the current training leads to a lack of basic flying skills and inability to cope with an inflight emergency, especially mechanical failures. The union believes passenger safety could be at risk. The Veillette-Decker seminal study on automation came at a time when automated flight decks were entering everyday line operations and concern was growing about some of the unanticipated side effects. Deterioration of basic pilot skills was one of these concerns. While automation made the promise of reducing human mistakes, in some instances it actually created larger errors. When this study was undertaken, the workload in an automated flight deck in the terminal environment actually seemed higher than in the older conventional flight decks. At other times, automation seemed to lull the flight crews into complacency. Fears arose that the manual flying skills of flight crews using automation deteriorated due to an overreliance on computers. In fact, BALPA voiced a fear that has dogged automation for years: that pilots using automation have less “stick and rudder” proficiency when those skills were needed to resume direct manual control of the aircraft. Thus, the Veillette-Decker study sought to determine what, if any, possible differences exist in manual flight skills between aircrews assigned to conventional and automated flight decks. Limited to normal and abnormal operations in terminal airspace, it sought to determine the degree of difference in manual flying and navigational tracking skills. Commercial airline crew members flying the conventional transport aircraft or the automated version were observed during line-oriented flight training. The data set included various aircraft parameters such as heading, altitude, airspeed, glideslope, and localizer deviations, as well as pilot control inputs. These were recorded during a variety of normal, abnormal, and emergency maneuvers during 4-hour simulator sessions. All experimental participants were commercial airline pilots holding airline transport pilot certificates. The control group was composed of pilots who flew an older version of a common twin-jet airliner equipped with analog instrumentation. The experimental group was composed of pilots who flew newer models of that same aircraft equipped with a first generation electronic flight instrument system (EFIS) and flight management system (FMS). When pilots who had flown EFIS for several years were required to fly various maneuvers manually, the aircraft parameters and flight control inputs clearly showed some erosion of flying skills. During normal maneuvers, the EFIS group exhibited somewhat greater deviations than the conventional group. Most of the time, the deviations were within the Practical Test Standards (PTS) or Airman Certification Standards (ACS), but the pilots definitely did not keep on the localizer and glideslope as smoothly as the conventional group. The differences in hand-flying skills between the two groups became more significant during abnormal maneuvers such as steeper than normal visual approaches (slam-dunks). Analysis of the aircraft data consistently had pilots of automated aircraft exhibit greater deviations from assigned courses and aircraft state parameters, and greater deviations from normal pitch and bank attitudes, than the pilots of conventional flight deck aircraft. [Figure 7-2] The most significant differences were found to occur during the approach and landing phases. It is industry practice to tolerate very little air speed deviation from the recommended value during approach and landing. The FAA’s Practical Test Standards (PTS) or Airman Certification Standards (ACS) for the airline transport rating allow a final approach speed of no more than five knots faster than recommended. Figure 7-2. Two flight decks equipped with the same information but in two different formats: analog and digital. What are they indicating? Chances are that the analog pilot will review the top display before the bottom display. Conversely, the digitally trained pilot will review the instrument panel on the bottom first. Another situation used in the simulator experiment reflected real world changes in approach that are common and can be assigned on short notice. While a pilot’s lack of familiarity with the EFIS is often an issue, the approach would have been made easier by disengaging the automated system and manually flying the approach. While the Veillette-Decker study offers valuable information on the effects of cockpit automation on the pilot and crew, experience now shows that increased workloads from advanced avionics results from the different timing of the manual flying workloads. Previously, the pilot(s) were busiest during takeoff and approach or landing. With the demands of automation programming, most of the workloads have been moved to prior to takeoff and prior to landing. Since Air Traffic Control (ATC) deems this the most appropriate time to notify the pilot(s) of a route or approach change, a flurry of reprogramming actions occurs at a time when management of the aircraft is most critical. Reprogramming tasks during the approach to landing phase of flight can trigger aircraft mishandling errors that in turn snowball into a chain of errors leading to incidents or accidents. It does not require much time to retune a VOR for a new ILS, but it may require several programming steps to change the ILS selection in an FMS. In the meantime, someone must fly or monitor and someone else must respond to ATC instructions. In the pilot’s spare time, checklists should be used and configuration changes accomplished and checked. Almost without exception, it can be stated that the faster a crew attempts to reprogram the unit, the more errors will be made. Since publication of the Veillette-Decker study, increasing numbers of GA aircraft have been equipped with integrated advanced program avionics systems. These systems can lull pilots into a sense of complacency that is shattered by an inflight emergency. Thus, it is imperative for pilots to understand that automation does not replace basic flying skills. Automation adds to the overall quality of the flight experience, but it can also lead to catastrophe if not utilized properly. A moving map is not meant to substitute for a VFR sectional or low altitude en route chart. When using automation, it is recommended pilots use their best judgment and choose which level of automation will most efficiently do the task, considering the workload and situational awareness. Pilots also need to maintain their flight skills and ability to maneuver aircraft manually within the standards set forth in the PTS or ACS. It is recommended that pilots of automated aircraft occasionally disengage the automation and manually fly the aircraft to maintain stick-and-rudder proficiency. In fact, a major airline recommends that their crews practice their instrument approaches in good weather conditions and use the autopilot in the bad weather conditions and monitor the flight’s parameters. More information on potential automation issues can be found at the flight deck automation issues website: www.flightdeckautomation.com. This website includes a searchable database containing over 1,000 records of data that support or refute 94 issues with automated flying.